We put the salmon and spring onions in bowl, squirted on some ketchup and mayo, and Tyler squeezed the lemon over it for some lemon juice. He really got into squeezing this lemon! I mixed it all up with my hands (Tyler did not want to put his hands in it! ), and made 6 balls. Yes he’s still squeezing that lemon! 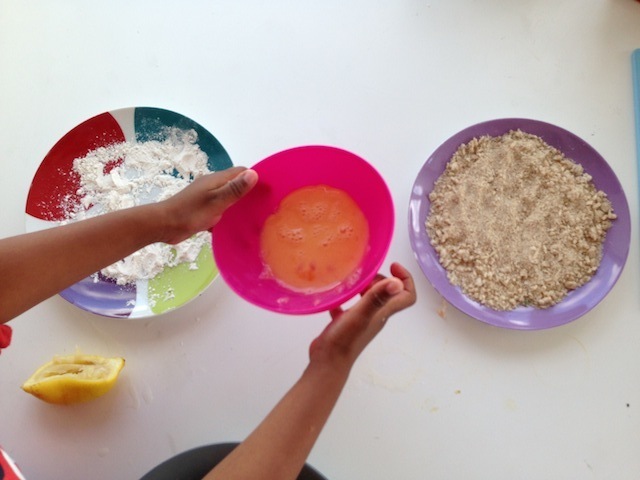 Next we put our flour, egg and dried breadcrumbs in a row to make a sort of assembly line. I rolled each fishcake in flour, dipped it in the egg and rolled in breadcrumbs. I then shaped them into fish shapes and put a pea in for an eye. Now my fishcake were not sticking together very well, I now realised that I forgot to put fresh breadcrumbs in with the salmon and spring onions at the beginning. So add that in if you’re going to try this! I fried the fishcakes in a large frying pan with sunflower oil, 1 and a half minutes on each side. Now they did look blackened, but they actually weren’t burnt and tasted good! Here is Tyler’s plate of dinner. And he ate all of them! 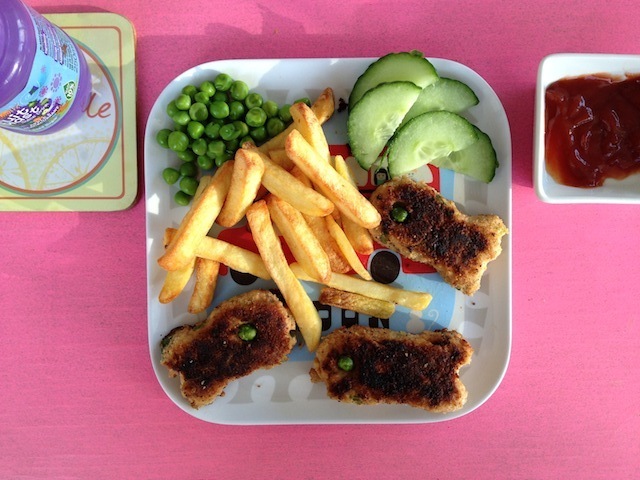 I had to break them into little pieces as he wouldn’t eat them whole – maybe because they looked like fish, who knows why?! – but as this was his first time ever eating salmon, I’d say this was a success! 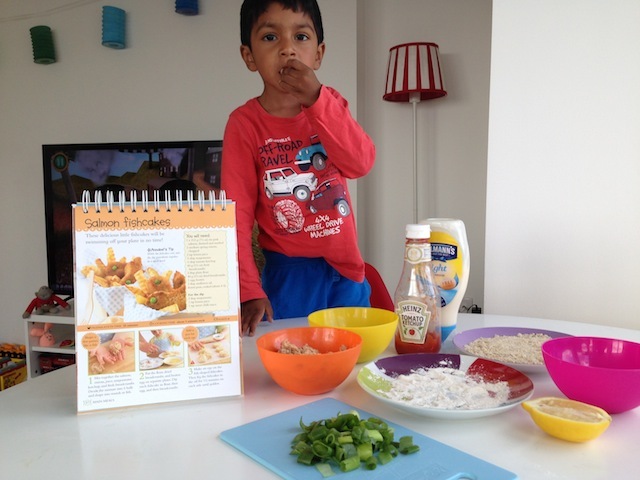 And the boy had loads of fun ‘helping’ me cook. Why don’t you give it a go? They look so groovy! 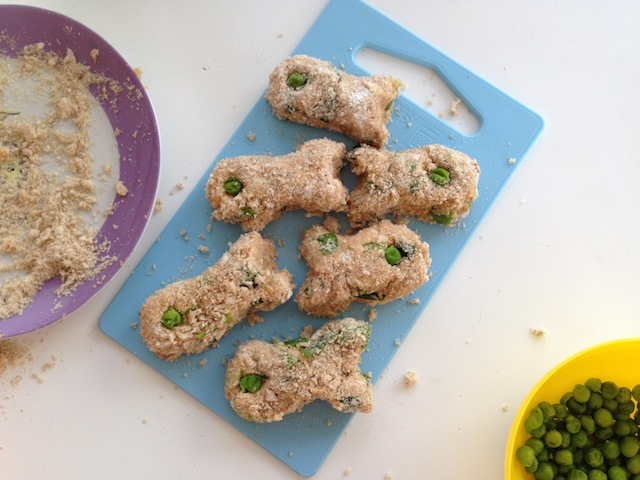 Love the idea of the peas for an eye. My kids are not fish fans but maybe this might pursuade them? 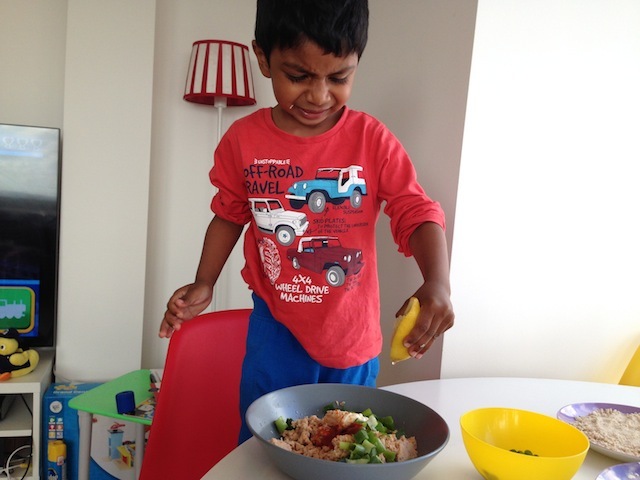 I can’t wait to cook with J once he is a little bigger…we are still at the ‘mix mix’ stage. These look yummy! 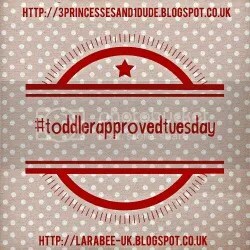 I have some of her baby recipe books but really should upgrade to the toddler one now my girl is 3 1/2 years old. I really do love her recipes. These look so yummy! 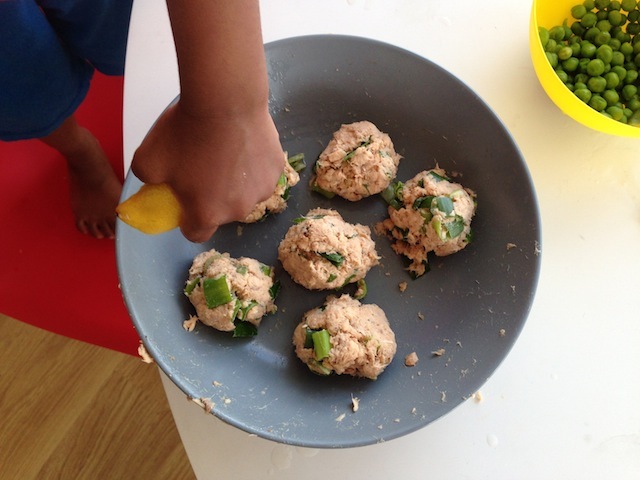 We have made fishcakes before and they went down a real storm! I will definitely be giving this recipe a try to!